We woke on yet another warm summer morning in Golden Bay. It had been 25 degrees in our tent during the night and I was really hanging out to go across the road to the river for a swim but the shuttle was going to be here soon. So it was a quick breakfast and then out to the road to wait for our ride. We were just out of Takaka at Paynes Ford and our shuttle would take us over Takaka Hill to Marahau, the gateway to Abel Tasman National Park. Our plan for this trip was a one day traverse of the Park from Marahau back to Takaka, climbing up the Inland Track to Mt Evans, across Canaan Downs and down the Rameka track. It was a very civilised start at Marahau; we sat down for a cup of tea at the café at the end of the road before we set off at about 8:30am. Luckily for us it was an overcast day as the previous days had been scorchers, well over 30 degrees. The cloud even sent the occasional drizzle down to cool us off, yet the cloud was high enough to allow us full views. Best of both worlds! The Inland Track is a pretty well formed track, good enough to be able to run most of it. It wanders through manuka/kanuka and lots of young natives. The bush here is still in the long process of regeneration. There are two little side trips to Castle and Porter Rocks up along the Inland track, and both offer wicked views. 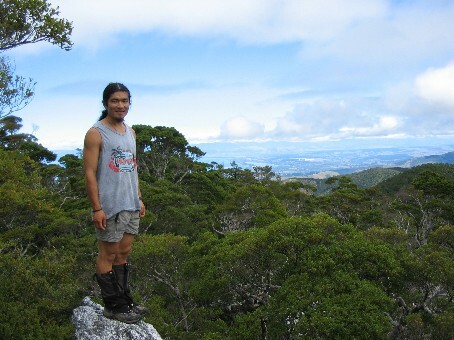 From Castle Rock you look down on Marahau, while from Porter Rock you can see as far as Awaroa Bay. We eventually arrived at Moa Park Hut, where an old un-maintained track leads up for about an hour to Mt Evans. 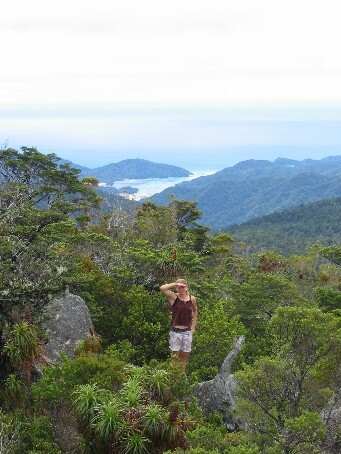 Luckily at the summit the rocks clear the trees just enough to give you views of Canaan Downs, Motueka, Richmond and Tasman Bay. Past Moa Park Hut, the track gets a bit tree-rooty, but soon clears to a 4WD road before leading into the Ramaka track. The Rameka is a popular mountain biking track so is easily run-able. 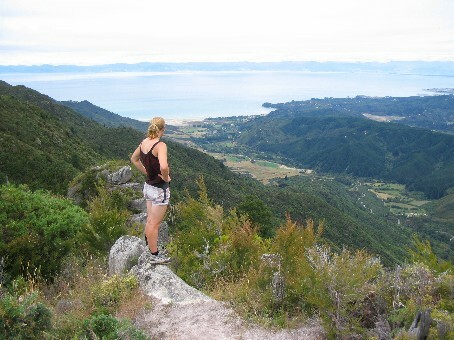 It winds through beautiful native forest before breaking out onto farm land for the long descent down to Takaka. We were getting a bit sore at this stage, so opted to walk down the hill. Wicked views of Golden Bay bathed in warm late afternoon sun, and being chased by a wild sheep kept us entertained on the descent. We arrived back at Hangdog just in time for a gorgeous swim in the Takaka River and fish n chips at Golden Fries. Happily content, sleep came easily that night…..